China has established rules for "homeowner committees" to motivate urban property owners to organize and administer their neighborhood affairs through community elections and self-governance. However, this well-intentioned plan has met resistance from property management companies and local governments. Chen Fengshan was threatened, the corridor outside his home was coated with feces and a cremation urn was placed outside his door. The founder and head of the "homeowners committee" of his Beijing residential community, Chen has been battling with the property management company over the ownership of the community's public facilities since 2009. Parking space rent revenue in the community generates more than 2 million yuan ($300,000) a year. Chen believes it belongs to all the homeowners in the community according to Chinese law. Currently, the property management company pockets all of it. Although the committee is legally entitled to choose and dispose of property management companies, this is usually difficult to achieve as these companies resist losing their control of a community. Besides personal attacks, banners emblazoned with anti-committee slogans have been hung around the community by the company. On the day in 2009 that the homeowners committee held their election, the polling station was damaged by hired thugs, the committee's office was vandalized and committee members and volunteers received death threats. The election failed in the face of this harassment. Later on when the committee came to its next election, many members chose to quit instead of staying on. "The community's self-governance then failed, which is a shame," Chen said. Seeing the power imbalance between the homeowners committee and the property management company, Chen studied the laws regarding property rights and now provides legal support to homeowner organizations inside and outside Beijing. He now represents more than a dozen homeowner committees. Though they often feel powerless in the face of thuggish management companies, homeowner committees were meant to be rather muscular. 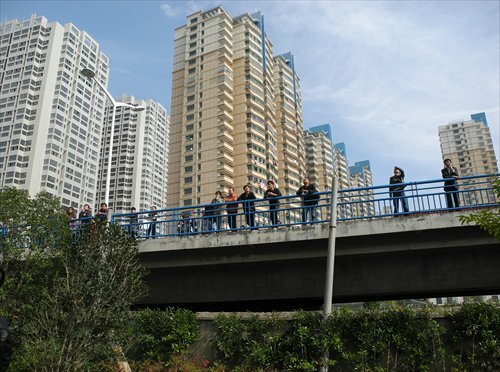 The National People's Congress approved the Real Right Law in 2007, which promoted the concept of self-governance by property owners in urban residential communities, allowing homeowners living in the same community to create "homeowner congregations" to administer the affairs of their neighborhood. A standing "homeowner committee" should be chosen by residents to act on behalf of all homeowners, according to the law. It was hailed by many at the time as an important step toward democracy on the grass-roots level. After more than three decades of the development of the real estate industry, hundreds of millions of Chinese urbanites now own properties. As their awareness of their rights rises and they want to have more say over how things are run, disputes between homeowners and property management companies are increasingly common. Chen believes that homeowner committees acquiring legal status is only the first step toward allowing homeowners to exercise their rights. He told the Global times that Chinese homebuyers are not fully aware of their property rights, only caring about the space inside their door but ignoring their collective ownership of the community's public spaces and facilities. But when a person buys a property, a great part of their rights - over the public facilities - have already been taken on by the property management company. Only by establishing a homeowners committee can property owners represent their interests. "The fact that property management companies are mostly chosen by the property developer - some are subsidiaries of the developers - means the property management companies have a natural advantage over property owners where conflicting interests occur," said Chen. 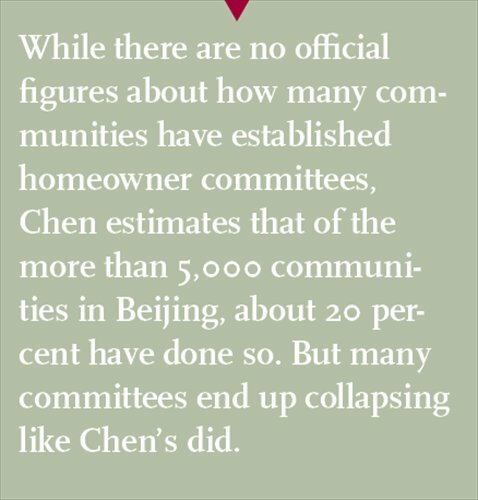 While there are no official figures about how many communities have established homeowner committees, Chen estimates that of the more than 5,000 communities in Beijing, about 20 percent have done so. But many committees end up collapsing like Chen's did. In practice, many activists complain it's unexpectedly difficult for such committees to act. Even the very first step - establishing a homeowner committee - often proves to be a daunting task. In Swan Bay, one of the communities which Chen has advised, just organizing an election proved impossible. The glitzy community in Beijing's Chaoyang district first welcomed residents in 2007. However, vexed by poor property management, many residents demanded the management company get better or leave, and the only way to make sure this would happen was to elect a homeowners committee. After lots of paperwork and preparations, elections were held in late March this year and 1,000 residents cast their votes. However, all of the ballot boxes stuffed with votes were seized by the neighborhood committee, China's lowest-level government organ usually in charge of several hundred urban households. The local Party chief, who was appointed head of the working group in charge of preparing for the election, announced that a superior government had decided to lock up the ballots indefinitely due to "disordered preparation for the voting," without further explanation. Homeowner representatives argue it is unacceptable that the neighborhood committee has cut their democratic experiment short, believing that their right to represent their own interests is legally guaranteed. The dispute at Swan Bay community is a typical faceoff between committee organizers and local governments. The Real Right Law and subsequent municipal decrees request that the local government only "assist," "guide," and "supervise" the establishment and activities of the homeowners committee. Fu Yingtao, one of the Swan Bay homeowner representatives, said the two parties interpret the law differently. Homeowners tend to believe they should be free to exercise self-governance and the government should support them rather than dictate every bit of the process. But Chen says that in his experience, it's hard for governmental organs not to interfere. Though Chen admits that governments have been changing their attitude overall and the legal environment for these disputes has improved in the past couple of years. It's easier for homeowner committees to get support from the authorities when filing a lawsuit against property management companies, including acquiring official documents concerning the residential community. Corruption is a key factor that obstructs the establishment of homeowner committees. Critics say the marketization of property in the past three decades has moved faster than China's legal construction, creating room for malpractice in the unregulated sector. Li Haibo, a resident of Dongba Jiayuan, a community in Beijing's Chaoyang district, has been petitioning various government departments because he claims he was illegally detained by the police while collecting signatures from his neighbors to help set up a homeowners committee early this year. He wanted to formally establish a committee and acquire legal status to get the local government to hand over documents about his community. He believes that a homeowners committee, representing all the residents of the compound, would find it easier to get the information than an individual acting alone. Li wanted to use the official documents to prove the developer illegally changed its construction plan for the community to make apartments larger so they could make more money. Li claims that he couldn't get his property certificate - which he will need if he ever wants to sell his home - from the district government as they claimed they had never approved the construction of his home, due to the changes that were made to the plan. His efforts were in vain as he was pushed around by the development company and the Dongba township government, which is the biggest stakeholder in the company. Li told the Global Times that he suspects the township government knew about the developer's illegal actions, and that if the homeowners committee was set up and acquires the related construction records, their malpractice will be revealed. This couldn't be verified by the Dongba government. Li's claims are not fanciful as there have been many cases in which developers have changed construction plans illegally. The Beijing News reported in 2013 that deputy mayor Chen Gang told a meeting that Beijing has 1.4 million square meters of illegal construction. Chen said similar instances of malpractice by local governments in real estate development are not uncommon. Once homeowner committees are widely established, these crimes will be made public. "It will be like Pandora's Box was opened," he said.